WASHINGTON – In anticipation of the busiest travel period of the year, Amtrak is preparing to accommodate the expected surge of holiday travelers with additional trains and extra seats on several routes in the Northeast, Midwest and West Coast. Amtrak will operate every available passenger rail car in its fleet but tickets sell out quickly so customers are encouraged to plan ahead and book early for best availability and pricing. On the Northeast Corridor, Amtrak Acela Express and Northeast Regional services will operate full and extended schedules with additional frequencies and added capacity between Washington, D.C. and Boston. 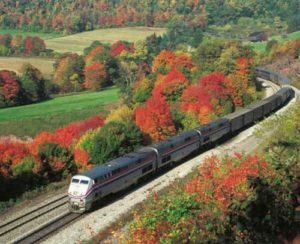 In response to customer demand, Amtrak will operate additional trains on both the Tuesday and Wednesday before Thanksgiving, Nov. 22 and 23, as well as the Sunday after, Nov. 27. Amtrak will also run “Holiday Extra” trains between New York and Washington, D.C. on Sunday, Nov. 27 using equipment leased from our commuter partners. Regular Amtrak booking and ticketing procedures apply. With the friendliest baggage policy in the travel industry, free Wi-Fi for 90% of Amtrak travelers, no “middle seats” and a nationwide network serving over 500 destinations, customers throughout the country find Amtrak to be the smarter way to travel to be with family and friends for the holidays.